This article was originally written by Matt Martell and appeared in The Daily Collegian on October 30, 2015. It has been republished with the author’s permission. While Penn State modifies its practices to counteract the grueling first 10 games of the season before its bye week, Chris Godwin may have found a different way to keep his legs fresh. The wide receiver glides around campus on a balanced-based motorized transportation, known to some as a “hoverboard,” so he doesn’t have to put extra stress on his legs when walking. Whether it’s jumping for contested passes or dragging defenders on his back 20 extra yards after catching a pass, Godwin’s legs have quite a bit of mileage on them –– and he’s only in his second year with the Nittany Lions. But fatigue hasn’t kept the sophomore from the field thus far in his collegiate career. Godwin has yet to miss a game since playing in the Lions’ 2014 season opener in Dublin. Wednesday, Godwin was added to the Biletnikoff Award watch list, which is given to the nation’s top wide receiver at the end of the season. DaeSean Hamilton is the only other Penn State player on the watch list. Godwin leads the Lions in receptions and receiving yards this season. His 628 receiving yards are nearly double Hamilton’s 316, which is the second-highest on the team. Nationally, Godwin ranks No. 27 in yards per reception, 18.47, and No. 6 among players with at least 25 receptions. The receiver has provided Penn State’s quarterback Christian Hackenberg with a reliable target through the first eight games of the 2015 season. He has caught nearly 32 percent of the junior passer’s 107 completions this season. “[Godwin]’s a guy that you can depend on as the quarterback,” coach James Franklin said. Franklin preaches the importance of consistent play, which he said has allowed Godwin to make an impact in the games as often as he does. 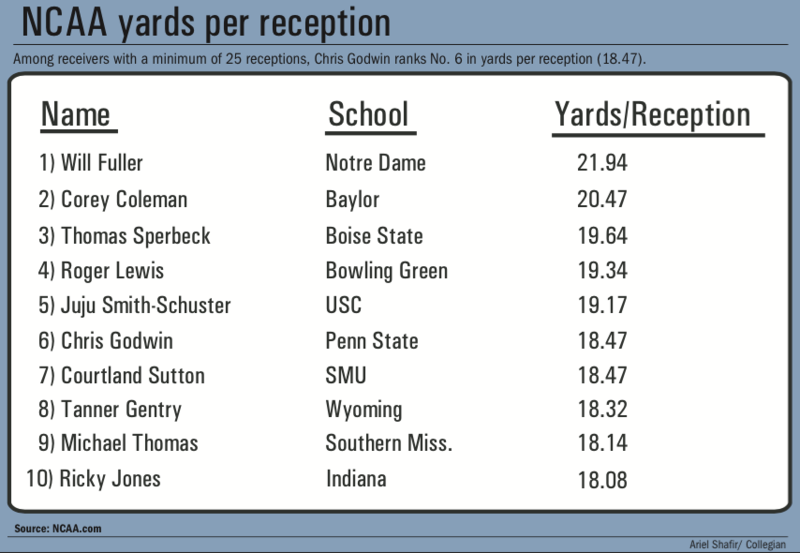 Godwin is averaging 4.25 receptions each game. The Lions’ loss to Ohio State was the only game in which the receiver caught less than four passes — he caught three for 103 yards. All season, Franklin has emphasized the importance of running the ball, and with the emergence of freshman running back Saquon Barkley, Penn State has gone to the ground 69 more times than it has passed. 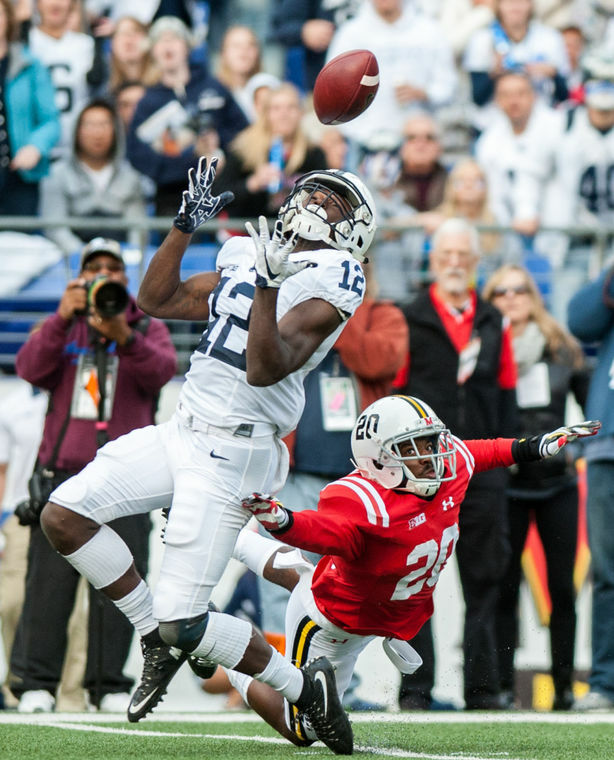 Opposing teams are starting to realize Barkley’s success this season, and when the Lions played Maryland, the Terrapins defense was determined to take the ground attack out of Penn State’s game plan. The Lions adjusted quickly to Maryland’s defense and began to take advantage of the one-on-one matchups between the receivers and the defensive backs. Godwin went out and recorded four catches for 135 yards, while also scoring a touchdown. Perhaps the receiver’s most impressive play came on his last reception of the game. Hackenberg dropped back to pass and was hit just as he was releasing the ball. The pass, which was intended for Godwin, was underthrown by about five yards. Double-covered, the receiver darted back for the ball, fighting through two ball-hawking defensive backs before snagging the pass. Two plays later, the Lions were in the end zone for the third time that game. Franklin said the two most important ways for receivers to impact the game are creating separation between them and the defensive backs, and catching passes when they do not create separation. 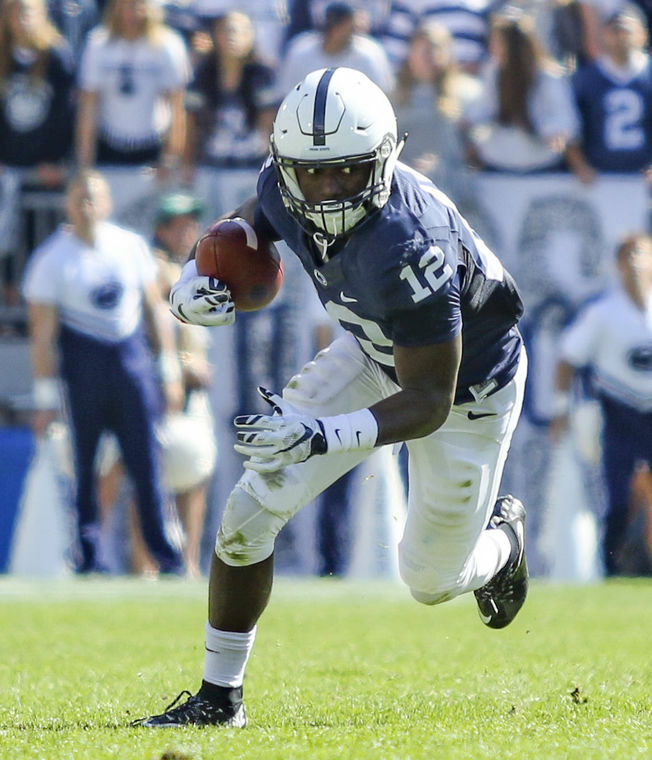 “Chris Godwin has done an unbelievable job [of catching contested passes],” Franklin said before the game against Indiana. Godwin credits his success to his preparation and his teammates, which he said gives him the confidence to go out and make plays.